There is no time-base for this sequence except that all frames are the same duration apart. Frame #1: The arms are extending forward as the kick commences limiting the period of time when no propulsive force is created. As with most top breaststrokers the feet are fully dorsi-flexed and everted and the knees are comfortably apart. No portion of the kick will be wasted through repositioning the feet. Frame #2: The arms continue extending forward with the hands turned out. The feet kick directly backward. Frame #3: The arms do not extend fully but are slightly bent at the elbows as the outsweep begins, a position that is more powerful than if the arms were locked straight. The kick is completed. The feet have moved directly backward and finish well apart. There has been no sweeping out and then in, just direct drive, an action that produces direct forward propulsion. The head enters the water face first. Frame #4: As the arms continue to move outward, the legs start to close in fully extended streamlined positions. The head continues to be lowered into the water. Frame #5: The arms sweep outward and the closing of the legs continues. The head and shoulders begin to bury. Frames #6 through #11: The outsweep of the arms continues but at a much slower velocity than the legs in the propulsive phase of the kick. Burying of the head and shoulders causes the hips to rise to the surface disrupting streamline. Frame #12: The arms suddenly change with the hands being repositioned to press backward. This action has characteristics of aspects of a butterfly pull. The hips begin to sink with the torso and hips being in better streamline. That alignment is helped by the head rising, which creates turbulence off the nose. Frame #13: Although the hands and arms continue to move outward, the propulsion developed is mainly backward. The head rises further. Frame #14: The elbows are high and begin flexing further. Propulsion from the hands and forearms is almost all drag force and backward. Propulsion is developed through upper arm adduction. The top of the head has broken the water surface. Frame #15: High elbows support direct propulsion from the hand/forearm surfaces as upper arm adduction continues. The head is now partly out of the water with the mouth at the surface. Frame #16: Upper arm adduction continues to power the hand/forearm surfaces. The head lifts further. The feet begin to rise, probably to counter-balance the rising head. Frame #17: Upper arm adduction is completed. Some arm force is directed downward to support having the head and some parts of the shoulders out of the water. The feet rise higher and the knees bend. Frame #18: Arm propulsion ceases as the elbows draw into the body and the hands slow. The knees continue to bend at an increasing rate and preparatory to kicking. Frames #19 and #22: Inhalation occurs. The arms are narrowed and the hands eventually start to move forward. The legs continue to be drawn up. There seems to be a delay in hand recovery-speed that is timed with breathing (frames #18, #19, and #20). Frame #23: The hands are brought together after the breathing delay and the feet begin to be turned outward. Frames #24 and #25: The positions of frames #1 and #2 are repeated. 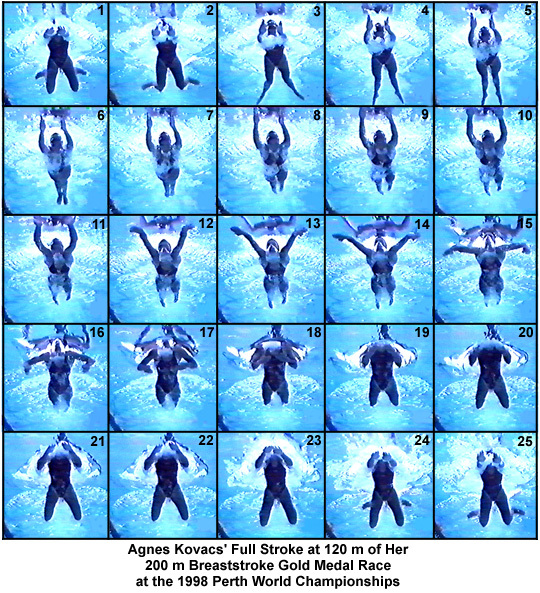 This stroke shows minimal effective outsweep and insweep. Arm propulsion is primarily a "butterfly-type pull" with a backward force being created through upper arm adduction. The speed and directness of the kick is particularly efficient and effective. This swimmer does not display many of the traditional concepts of breaststroke. She displays a direct propulsive arm pull as opposed to a "lift-oriented" lateral sweeping arm action. The slowing of the hands under the neck while breathing is one feature could be improved.